The images that comets and asteroids bring to mind are quite different – we typically think of comets as being bright objects with long tails, and asteroids as being dead lumps of rock. But in fact at closer inspection the differences are not as great as you might think! Comets and asteroids typically have different orbits – this is one of their key defining parameters. And of course comets, which typically spend much of their time in the outer reaches of the Solar System, undergo dramatic changes each time they pass close to the Sun. As comets heat up, ices present underneath the surface sublimate (that is they transform directly from solid ice to a gas) and stream out from the comet, dragging along ice and dust particles from the surface. Once free, these dust grains suddenly find themselves being pushed this way and that by a variety of forces – the gravitational field of the comet, the gas flux, and even the tiny but incessant force of sunlight. Over time these particles evolve into the “coma”, the long tail of the comet which can span half the Solar System, with the heart of the comet (the “nucleus”) being reduced to an invisible spot hidden by the bright coma. It is immediately clear that amongst the small bodies we have visited, the asteroids are larger; indeed the largest comets we know are considerably smaller than the largest asteroids. 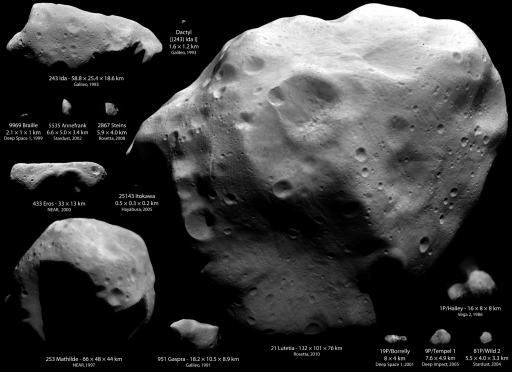 But a close up of either reveals very little difference – or, rather, many differences (since every asteroid and comet shows a unique surface), but very little to distinguish the two classes of object. What I find really interesting here is that the existence (or not!) of the cometary coma, an object that can be enormous, and has been a potent symbol for cultures through the ages, depends critically on the very outer layer of the already rather small cometary nucleus. For a comet to be active, heat has to penetrate through the dust crust (the hot, dry, outer layer of the comet) to the pristine ice, during the small time window when the comet is close to the Sun. 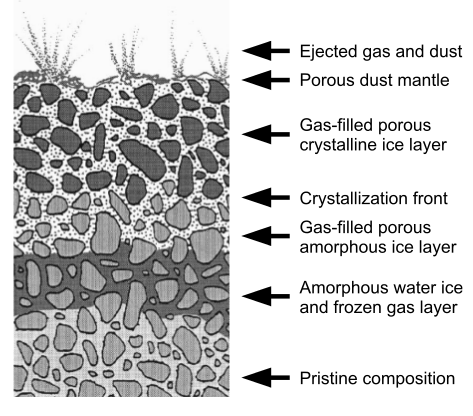 Typical comet models, like the one shown (from this paper), assume that during each passage the ice “front” retreats deeper in to the nucleus, and a fraction of the overall mass is loss as gas, dust and ice emissions. It used to be thought that this ice front, or equivalently the thickness of the dust (“mantle”) layer, was at some tens to hundreds of metres depth. However, recent observations – in particular the NASA mission Deep Impact – have suggested that ice can be found only a few centimetres below the surface. So now the story is really interesting! The existence of the coma, which can evolve to billions of kilometres in length, depends on a covering of dust a mere few centimetres thick! 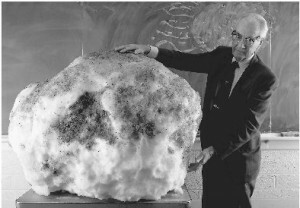 If the dust mantle is thick enough, heat doesn’t penetrate to the ice layer at all, and the comet can become dormant – effectively looking like an asteroid. The ease with which heat flows through a material is described by its thermal conductivity – materials with low conductivity are good insulators, whereas highly conductive materials allow heat to flow easily. Thermal conductivity is a straightforward parameter to measure for large lumps of material; it’s a little harder for granular materials, which conduct heat in a variety of ways non-uniformly! And of course to do this remotely on a spacecraft is even more tricky. Nevertheless, it is a parameter that cannot easily be estimated remotely. Infrared measurements of the surface temperature can help, but you really need to get down and dirty with the comet to get a good measure of conductivity! This entry was posted in Science and tagged asteroid, comet, Rosetta. Bookmark the permalink.